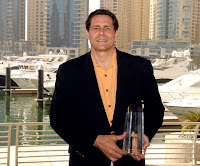 Dubai, UAE; May 12, 2009: Dubai Marina Yacht Club, the recently opened yacht club and marina owned and managed by Emaar Hospitality Group, was voted ‘Best New Asian Marina/Yacht Club’ at the Asia Boating Awards held recently in Shanghai. The Asia Boating Awards have been running for five consecutive years and recognize the efforts being made to develop the leisure marine industry in Asia. A panel of over 18 judges was formed with key industry leaders to adjudicate the awards which honour yacht builders, marinas, charter companies, personality and design representatives who have made a difference in the maritime industry. Set on a 3.5 km canal by the Arabian Sea, Dubai Marina Yacht Club will eventually cater to over 500 yachts between 10 and 35 meters in length. The Club’s highlight is the elegantly designed Clubhouse overlooking its own 116-berth private marina, of which the ground floor opens out through a waterfront café/bistro onto a public boulevard encircling the canal. The Dubai Marina Yacht Club is quickly becoming the new centre of lifestyle yachting in Dubai, and features a marine retail shopping arcade, international yacht sales and brokers’ offices, a ship chandlery & nautical gifts store, a yachting fashion boutique and charter yachts. Hire a Yacht in Dubai nice blog. keep it up. your blogs are so impressive.